Life gets busy, and sometimes it isn’t possible to visit your loved ones who have passed. That’s why Ramsgate Floral Designs offers a unique Graveside Flower Delivery Service at Holy Cross Cemetery. We offer two recurring delivery services: monthly or weekly**. We also offer delivery for your special occasions throughout the year, such as birthdays, holidays, or days significant to you. You may choose either a rose bouquet* or our Ramsgate mixed bouquets in three different sizes. Our Ramsgate Bouquets are filled with the freshest seasonal flowers including mums, lilies, and roses. You also may customize your bouquet with flowers and colors you prefer. Please call us at (310)836-2586 to sign up for graveside delivery service. * Roses are red unless otherwise specified. ** We begin delivery every Thursday after the cemetery has been cleaned and complete deliveries on Fridays and Saturdays. 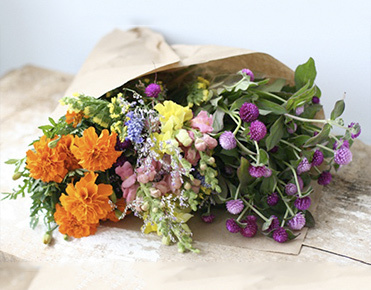 One-time graveside delivery bouquets start at $15.00 and may be scheduled for significant days throughout the year. There is a $3.00 delivery fee for one-time orders. Please note that Holy Cross maintenance cleans all gravesites on Thursday mornings. ​We deliver graveside and crypt bouquets each Thursday and Friday. Monthly accounts are delivered the first Thursday of the month.